Finding the best flooring for bathrooms is quite an easy task. That's because there's only a few flooring types that work best in bathrooms. We recommend vinyl flooring for any bathroom project. Because of how well it performs in wetter areas, a vinyl floor is best suited. By installing vinyl flooring in your bathroom, your floors will be able to with stand the constantly changing environment. Water Resistant Bathroom Flooring Options – Sheet vinyl is almost seamless, preventing water from seeping down to the sub floor. Bathroom floors that have warmth and comfort – Even though vinyl is hard-surface flooring material, it maintains a warmth and comfort that other materials don't. It's also easier to stand on for long periods of time. Easy to Clean Flooring – Maintaining and cleaning vinyl flooring is super simple. Just a wet mop and a little floor cleaner will do the job. Mimics Natural Material – Vinyl products are able to mimic natural material such as stone or wood almost perfectly. Slip Resistant Floors – Since vinyl is softer than other hard surface flooring, slipping on vinyl isn't common compared to tile or laminate. A natural looking material - Luxury vinyl tile and luxury vinyl plank flooring offer this. Vinyl flooring is also quite easy to install, so the installation crews won't be in your home all day. If bathroom flooring is something you would like to explore, it's time to get an estimate from a flooring company. 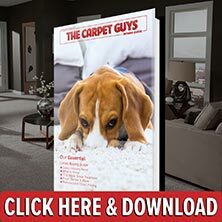 Here at The Carpet Guys, our installers know how to get the best performance out of vinyl. Our installation is precise, and we guarantee you'll love the way your vinyl looks and feels. We will bring multiple vinyl flooring samples straight to you. Forget driving to the store. We'll bring it to your door. Get your free vinyl flooring estimate scheduled with us today. You'll have beautiful vinyl in your bathroom before you know it.